The Aston Martin DB9, is a Grand tourer launched by Aston Martin in 2004 and is the first new car to be built at Aston's Gaydon facility. The name "DB" stems from David Brown, the owner of Aston Martin for a sizeable part of its history. This model, which was designed by Ian Callum and finished by his successor, Henrik Fisker, superseded the now-discontinued Aston Martin DB7 (also by Callum) which started production in 1994. 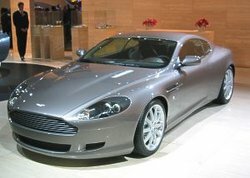 The DB9 comes in two variants; coupé and "Volante" convertible, each with a 6.0 L 450 bhp (340 kW) V12 engine taken from its sister car the V12 Vanquish. The Vanquish engine has 10 bhp (7 kW) more. In fact, this V12 engine is why Aston Martin did not call the car the DB8, which could suggest that it has only eight cylinders. As of 2004 production is expected be up to five thousand units a year which is roughly the same as its rivals, in particular the Ferrari 360 Modena and Porsche 911 Turbo. This should ensure that Aston Martin will continue into the 21st century. Traditionally being a maker of more exclusive automobiles, CEO, Dr. Ulrich Bez assures Aston loyalists' that production of the new and smaller V8 Vantage will be larger than previous model build outs, but nonetheless, Aston will still retain a small statistical amount of the high end sport's car market.